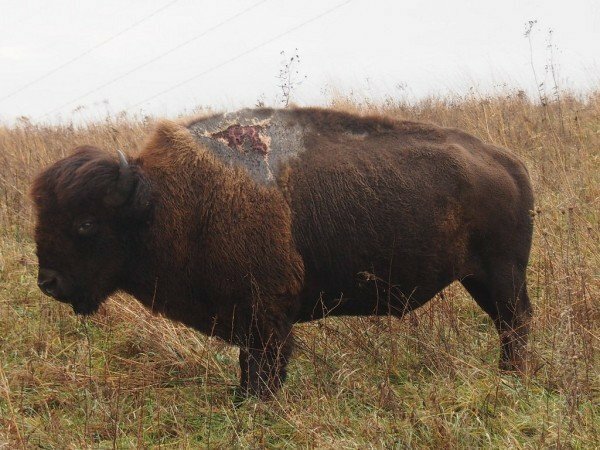 Wildlife officials at the Neal Smith National Wildlife Refuge in Iowa are proud to report that a bison struck by lightning in 2013 is still healthy and strong. It was touch and go for the bison they nicknamed Sparky for obvious reasons. Wildlife biologist Karen Viste-Sparkman discovered the animal during normal patrols two years ago. She could see the bison was severely injured with a tuft of hair missing from its back, blood trailing down its side and what looked like an exit wound on its hind quarters. The theory was the bison got struck by lightning while lying down. Animals getting struck by lightning is not too out of the ordinary in these parts and with no threatening predators, officials let nature run its course. Now that two years has passed, the refuge says the bison may even have fathered additional calves. They are currently conducting DNA testing to find out, according to a press release. If he did, that would be one tough bull.